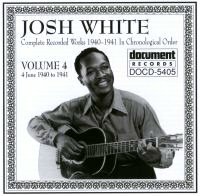 ¶ 3 Leave a comment on paragraph 3 0 Many writers have claimed that Dylan learned the song from a Josh White recording, although many other performers, including Blind Willie Johnson and Dylan favorite Charley Patton, also recorded it. Todd Harvey 1 says that he hears both Johnson and White’s styles in Dylan’s guitar playing. He also notes that the song pre-dates the twentieth century. ¶ 7 Leave a comment on paragraph 7 0 Given the dark subject matter, it’s not surprising that several hard rock groups have covered it, including The Animals, Led Zeppelin, and Metallica. ¶ 9 Leave a comment on paragraph 9 0 Robert Shelton 2 thinks In My Time of Dyin’ is the most compelling track on Dylan’s first album. I agree, it’s powerful. His plaintive singing and rough guitar-playing grabs the listener’s attention and never lets it go. It’s power is even more remarkable considering that he was only twenty when he sang this song of decay and death. ¶ 10 Leave a comment on paragraph 10 0 Dylan has never played this song live. Too bad. ¶ 11 Leave a comment on paragraph 11 0 A nice version by Blind Willie Johnson.